A big data infrastructure like PNDA involves a multitude of technologies and tools. Providing enterprise-grade security for such a system is not only complex, but is of primary concern for any production deployment. The PNDA team is working on a “security blueprint” that addresses each component, and the system as a whole. It’s not yet ready, but what follows is a discussion of some the main issues we’re considering, the direction we’re heading in, and the current thinking on how each component will be secured. In the world of Kerberos, each client or service is identified by the principal. At all times, the KDC (Key Distribution Center) server maintains a list of all principals in its internal database, coordinates authentication requests across nodes, and assures that everyone is who they say they are. Some underlying technologies in PNDA, such as Kafka, Hadoop, and HBase, don&apos;t include support for users. They rely on the UNIX users of the node on which they are run. Kerberos user principals typically have the format username@realm.com. Hadoop converts this two part principal into local Unix user name by stripping of domain name. PNDA is a complex system involving multiple nodes. In order to synchronize all user and group level mappings in one place, our intention is to leverage an LDAP directory and configure nodes to resolve enterprise users via PAM. The core services are runs as UNIX daemons under the same name as local UNIX user. For example, HDFS is run as the hdfs user and HBase is run as the hbase user, sharing a common group called hadoop. These users by design are assigned &apos;super user&apos; status. To prevent malicious attacks and for added security, they can possibly be created as UNIX users on nodes and be white-listed from submitting any jobs. The first step in securing any system is authenticating the user, in other words identifying who they claim to be, before they are allowed to use any services. Kerberos forms the basis of authentication in PNDA. The second step is authorizing the user, that is to say identifying what an authenticated user can access in regard to data, cluster resources, etc. In the following sections, we go into detail how we plan to tackle some of these concerns with regard to each component. Authentication is only part of a story; Kafka also needs to have authorization rules regarding who is allowed to CREATE/READ/WRITE on specific topics. Authorization rights for Kafka Manager to create a topic with CREATE and DESCRIBE permission. The above discussion is about how Security can be enabled since the Kafka 0.9.0 release. Work is still ongoing for some dependent components such as Logstash, Kafka manager, and the Spark-Kafka connector. Let&apos;s consider that you have generated the right keys and certificate. In this example, we will use Kafka 10.0.1 and will just use PLAIN/JAAS files for authentication. Then on the producer window, you can type some message and you should see them on the consumer window. It needs to have a Kerberos principal of its own, with proper authorization rights on HDFS, Oozie, and HBase. It needs to authenticate itself by running a kinit before accessing REST APIs like HTTPFS or Oozie over SPNEGO.md. Batch applications are submitted to a cluster using the Oozie scheduler. Before we go into details of how application security is supported, it&apos;s worth understanding the details of how Oozie works in a secure cluster. The Oozie scheduler primarily consists of two parts, the server and the client. The server, on behalf of the client, submits the end user&apos;s jobs to services like ResourceManager or JobTracker. When submitting jobs on a secure cluster, it needs a Kerberos principal of its own. Since some of these jobs may run for days or weeks, credentials are renewed programmatically using a server keytab file. Does this mean anybody can submit jobs to an Oozie server? Not really. The Oozie client front end can be secured using Kerberos, and the Deployment Manager can authenticate itself using its principal before submitting batch jobs for an application. This way the credentials are validated only during job submission, and Hadoop services will be able to execute long running job requests by validating with the Oozie server credentials. Can authorization rules be applied for a user without them ever providing their credentials? This is where the proxy user comes in, using a technique called impersonation. The Deployment Manager, when submitting jobs can impersonate on the real user&apos;s behalf using the -doas option of the Oozie API. For long-running apps, such as ones that use Spark Streaming, to be able to write to HDFS or use YARN, it is possible for the application to pass a principal and a keytab to spark-submit via the --principal and --keytab parameters, respectively. The keytab passed in will be copied over to the machine running the Application Master via the Hadoop Distributed Cache. (It will be copied securely, if YARN is configured with SSL and HDFS encryption is enabled.) The Kerberos login can be periodically renewed using this principal and keytab, and the delegation tokens required for HDFS access will be generated periodically. Gobblin requires a user principal to run long running jobs on a secure cluster. It needs to get a delegation token periodically for accessing cluster resources, which in turn requires it to renew KDC credentials. To run Gobblin on a secure cluster, the application.conf file needs the Kerberos principal name and keytab location. HBase can be secured using SASL with Kerberos to prevent unauthenticated access to data. A secure HBase is also dependent on HDFS and Zookeeper being secure, as it uses HDFS to store its data and metadata on Zookeeper. Once authentication is enabled, clients may have to do login via kinit either using the shell or through a Java client. Create (C): can create tables or drop tables (even those they did not create) at the given scope. The possible scopes are superuser, namespace level, table level and even at column level. For further information, see chapter 60 in the the HBase Guide. Once a user identifies themself against HDFS through Kerberos, their file or folder ownership is verified against user name and group memberships. 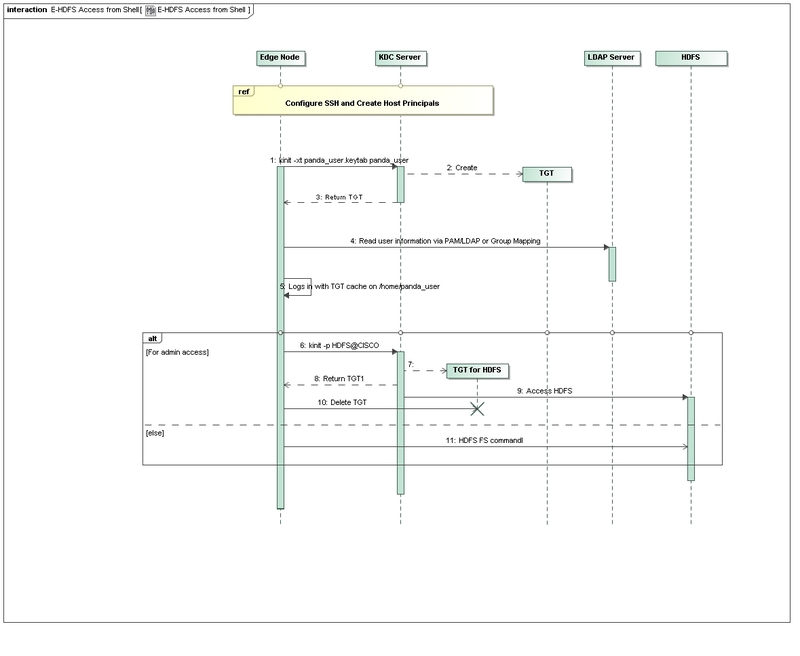 However, a simple permission model of the single user and group is insufficient for a multi-tenant platform like PNDA. To support multiple users and group level permission, HDFS can be configured for extended POSIX Access Control Lists (ACLs). An ACL consists of a set of ACL entries. Each ACL entry specifies a name and group and grants read, write or execute permission for a file or folder. The ACL scheme also differentiates between an ‘access ACL’ and ‘default ACL’. Default ACL is what assigned to subfolders and directories when they get created under parent folder. Impala, the open source analytic database for Apache Hadoop, supports authentication using both Kerberos and LDAP. Using LDAP and Kerberos together provides significant value. 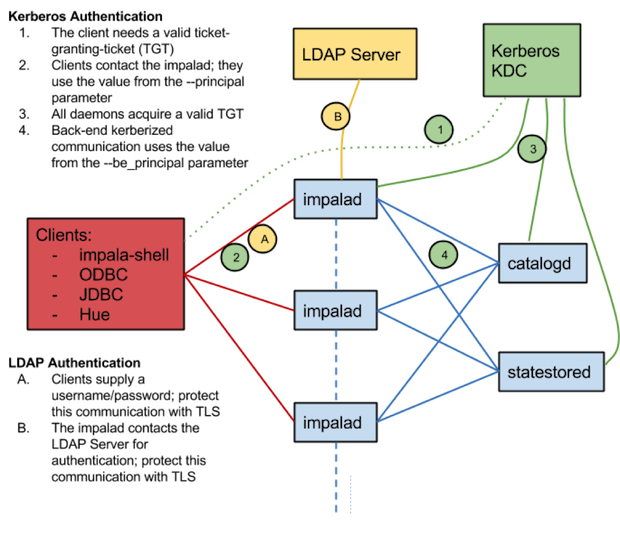 Kerberos remains the core authentication protocol and is always used when Impala daemons connect to each other and to the Hadoop cluster. LDAP is ubiquitous across the enterprise and is commonly utilized by client applications connecting to Impala via ODBC and JDBC drivers. A mix of the two therefore makes sense in the case of PNDA. OpenTSDB is essentially a time series database that runs above HBase. It consists of TSD( Time Series Daemons) that uses HBase to store and retrieve data. Clients can communicate with TSDs through HTTP API for dashboards or statistical inference. API access to OpenTSDB can simply be secured by running it behind a firewall or an HTTP Server like Ngnix. Cloudera Manager supports many security mechanisms for authenticating users. Within PNDA, we can configure Cloudera Manager to authenticate against an LDAP Server to have a common reference for user accounts.Cloudera Manager supports authorization through user roles. User membership in particular role determines what features are visible to user and actions they can perform. Like Cloudera Manager, we can also enable LDAP authentication for Hue to have shared repository of enterprise user accounts. Hue can also be configured to support impersonation whereby users logging into console can access all cluster services without actually authenticating themselves against Kerberos. 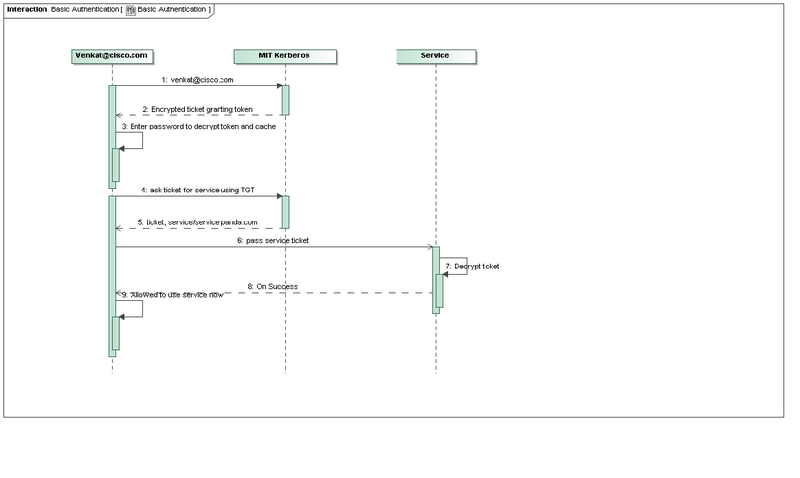 The Main console can implement LDAP over TLS as the frontend authentication scheme. Since existing interfaces like Cloudera Manager and Hue also integrate with LDAP, it makes sense to adopt LDAP over TLS as an authentication mechanism. Use of LDAP also argues well for the future, if we need to enable SSO with an enterprise identity provider or integrate with their existing directory service. SPNEGO with Kerberos authentication can be configured for the Web UIs of HDFS, YARN, MapReduce2, HBase, Oozie, Spark, etc. PNDA users who need terminal access to the cluster need to authenticate themselves using Kerberos over SSH at the edge node. SSH can be configured to delegate the TGT ticket, thereby allowing the user to access cluster services. SSH with Kerberos provides cryptographic authentication that doesn&apos;t give away the user&apos;s password, and the ticket cache offers the same advantages as the key agent, allowing for single sign-on. 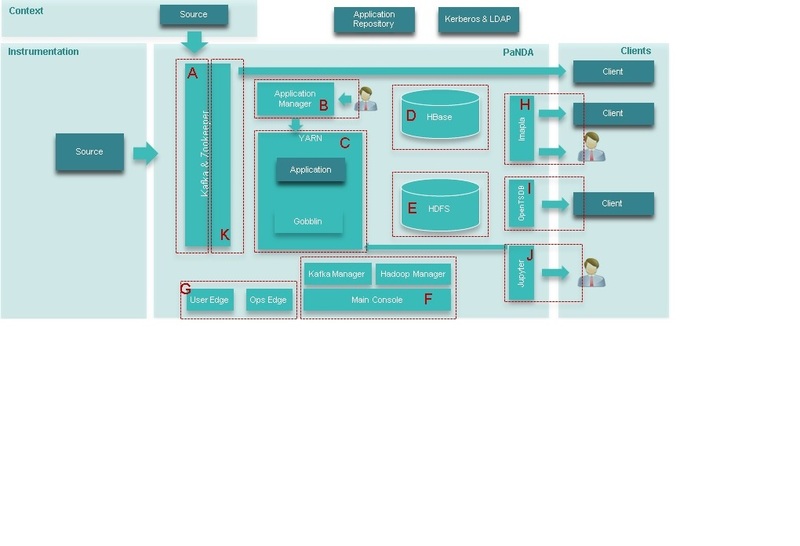 As one can see from above discussion, securing a distributed system like PNDA is not only very complicated but equally challenging to meet security needs of a modern enterprise. As part of this blueprint, we barely scratched the surface. There is still a lot to be explored in areas like Transparent Encryption for Data Rest/ Motion, Centralized authorization policy management either through Apache Sentry/Ranger, Data Audit, Lineage and Redaction needs and Service level requirements regarding Yarn queue consumption, disk quota, etc.